A Librarian's Response to "What's a Library?" 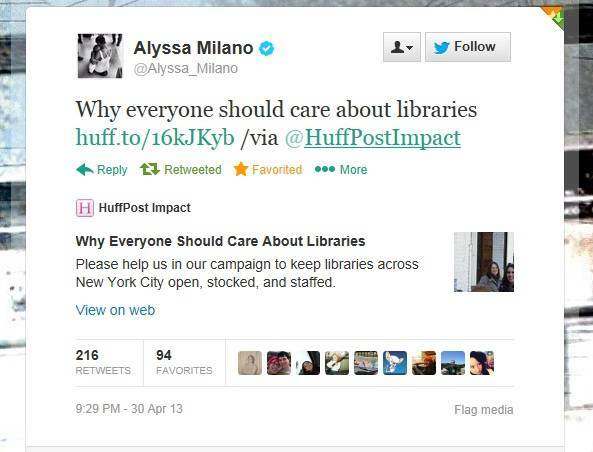 There are two recent library-related articles on HuffPo to which I’d like to draw your attention. By the way, the article was retweeted by Alyssa Milano, which has nothing to do with anything except I thought it was cool. The second article “What’s a Library?” (discussing the rebuilding of the Donnell Library in NYC, sorta) by Michael Rosenblum is a good example of how mostly negative misconceptions about libraries today are being played out in the media (which is a frustrating and dangerous thing for libraries right now in terms of public perception and support). I’m not sure how a person can claim that a place isn’t useful if that person has never actually even been INSIDE of said place, but, hey, we all make silly generalized statements sometimes. Moving on. Watch out, Mr. Rosenblum, your privilege is showing! Might want to cover that up. Look, I understand that people have access to wonderful things these days in terms of technology…but these things are NOT easily accessible to EVERYONE. It’s not as simple as clicking a button for many, many people in NYC. It’s really important to remember that just because YOU (general “you”) don’t need to use something on a daily basis, it does not mean that others don’t need to use it. Not to mention the fact that accessing the web ISN’T free, and it’s not always easier to “find stuff” on the web than in a library. I help people in the library all the time who don’t even know how to type “Google” into a search box or even know what a search box IS. Do you (again, general “you”) really think they are going to be able to easily find the correct information they seek? Besides the ridiculousness of this statement (I mean, why would secret material about the Dark Arts even BE on the web? ), it makes me legitimately sad to think that a kid wouldn’t understand why a library is a valuable place. 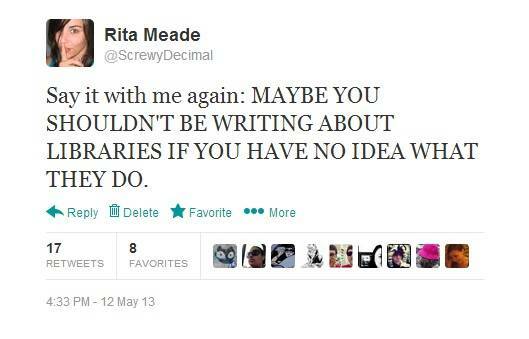 Besides, J.K. Rowling loves libraries! I don’t really understand the “Well, we’re just nostalgic for libraries because we were kids when we used them!” argument. Yes, a lot of people had great experiences as kids in libraries. And you know what? Kids today are having the same experiences! It might be a slightly different experience, what with the shocking lack of card catalogs and all, but it’s STILL a positive experience and beneficial in endless ways. Kids today will take that with them throughout life just like we did. Why would we want to deprive them of that? I…I don’t even know anymore. What this whole article shows, however, is that we (collective “we”) need to stop saying that libraries have been “killed,” especially when library usage is higher than ever before. Read this report! There’s good stuff in there. Again, I am confused. Is this article supposed to be celebrating the closing of libraries, or lamenting it? Honestly, I wouldn’t give articles like these a speck of my attention other than to roll my eyes IF the authors hadn’t been given a voice in a widely-read forum. As I have written in previous posts months ago about Terry Deary and Tony Lee, it’s less about trying to change their minds and more about not letting those misconceptions of libraries to be sitting out there in the spotlight, unchallenged. It always has been and will always be my opinion that where there is ignorance, people need to counter it with knowledge. And, incidentally, libraries just happen to be great places to gain knowledge. Pass the paint can, my friends, this library soapbox is getting a fresh coat. Am I the Only Person on the Internet Who Liked the Great Gatsby Movie?